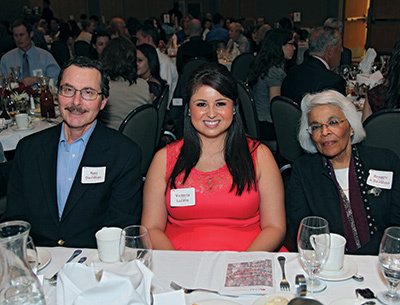 Russ and Revathi Davidson enjoy the annual Presidential Scholarship Program dinner this past spring with the scholar they sponsored, Victoria Lucero. Russ Davidson, former curator of Latin American and Iberian Collections at UNM’s Zimmerman Library, and his wife have established two endowments to assist UNM’s Zimmerman Library in enriching its collections. The James F. Zimmerman Endowment for Latin American Materials and Programs, supports the acquisition of specialized research materials, as well as programs and publications informing U.S. and international students and scholars about the collections. The Howard L. Karno Endowment for Latin American Pictorial Collections helps enrich the library’s holdings of rare visual resources.